A sermon preached by Larry Benfield, the bishop of Arkansas, on November 6, 2016, at St. Luke’s Church in Hot Springs, Arkansas. This year’s church calendar is off by about one day, sort of like our internal time clocks are off by about an hour this morning. Halloween came on its appointed day, Monday, October 31st. It is, at least according to legend, that last gasp effort of the evil spirits of the Underworld to have their way with this world before being conquered by the saints of God on All Saints’ Day, which is supposed to be the next Day, November 1. Goblins came out on schedule this year in my neighborhood and were safely tucked in bed before midnight. But something odd happened this year. It was not on November 1 that the saints were commemorated. Really—did any of you go into any public square that day, as might have been the case six hundred years ago and hear the names of the saintly departed loudly proclaimed? Most people were not in church at all. All Saints’ Day, with its way of tying together the living and the dead into one great communion of saints in common worship, took place a day later, at near midnight, when a small, white ball went into the glove of a man named Anthony Rizzo at first base in Cleveland, Ohio, in the bottom of the tenth, and the World Series struggle was over. The evil curse was ended. The celebration began. Tears rolled down cheeks. And the names of the saints began rolling from the lips of the faithful. Famous names, as varied as Ernie Banks and Harry Carry. And the lesser known names of grandfathers and fathers and uncles who had taken their nieces and nephews and children and grandchildren to games at that sacred ground called Wrigley Park, but who had not lived to see this day. You might think odd of me to equate one of the Church’s principal feasts with a baseball game. After all, pro baseball is a supremely commercial enterprise, and Christianity has long been about something greater than profits and capitalism. But listen carefully. We have this week an example of what All Saints’ should be: the joyful bringing together in the here and now—at this moment—of the living and the dead into one great resurrected communion to celebrate the truth that the kingdom has arrived and that which was dead has found new life. More often than we would like to admit, the church can use a bit of nudging from culture, a reminder that the divine is seen in flesh and blood human beings in the actual, broken world around us. Unfortunately, the church often forgets its own message of good news. We see a world that is terrible and frightening, a world of—let’s face it—constant war for the past century over real estate and oil, and continued racial animus in this country, and politics built on nothing less than greed for self and hatred of others. We don’t see a way through the mess; we don’t imagine a thing that the church can do. So instead, we make excuses and say that things will remain broken and hurtful until the coming of Jesus at some point in the future. Or until our cold bodies are laid in the ground and then—and only then—do we see Jesus. But the Christian truth as proclaimed in scripture is that the kingdom is here, and Christ is present and can be seen. The letter to the Ephesians is our grounding in this truth. The writer tells us that Jesus has been raised from the dead, and—if you listened carefully to this lesson today—the writer proclaims that the church is now Christ’s body. We need not say, “Wait till next year.” In fact, the letter to the Ephesians goes on to say in the very next chapter that God HAS raised us up and HAS seated us at the heavenly places in Christ Jesus. We are not waiting for better news; we have won. Look in the mirror and look around us, and we see the resurrected body of Christ. That truth is hard to accept. It is so much more convenient to tell ourselves that one day we will see Christ than it is to look around and realize that this mess of ordinary and imperfect people has been resurrected and that we are standing in the midst of the kingdom. Even the academicians get wary, as when biblical commentators tell us that…well, maybe Ephesians wasn’t really written by someone as bright as St. Paul. Resurrection as a current reality is a scary proposition. To see everyone else around us as the body of Christ changes everything. There is no one left to fear or hate or take advantage of or use for political self-aggrandizement. Resurrection as a current reality changes how we vote and how we care for our next-door neighbor and how we spend our money and how we treat the stranger. The world this week saw Cubs fans weeping as they remembered holy moments in their lives. All Saints’ as a feast day gives us the chance to get a bit teary when we remember the dead in our own lives. But even more so, the teaching from the letter to the Ephesians gives us permission to weep when we see Christ’s body going down the street with a limp from a bad leg or in the guise of a person who barely speaks English working in a poultry processing plant or in a woman covered head to toe in a burka who is being yelled at in a grocery store. To help us realize that truth in some small way, we hold on to feasts such as All Saints’, when we call out the names of very ordinary people who happen to have been family members or friends: when we say that right now they are with all of us who are physically alive, and with all who will be alive in future years even though we do not yet know their names. On such a day we give names to people in baptism; and we call out the names of those being confirmed; and we might indeed get teary eyed, because we know it has taken so long to get to this time and place, with our gradual realization that the church is truly gathered here and now, as we say our prayers and share our sacred meal. 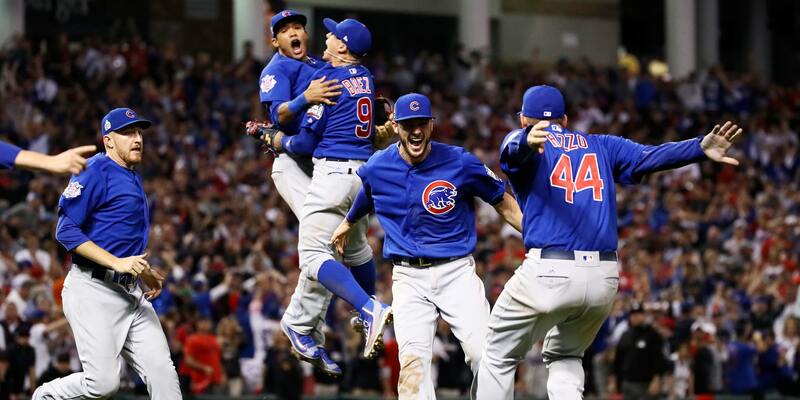 What the Cubs did this week in celebration is a nudge from the world that when people gather together to celebrate their history and their future, it is a holy moment, a moment to look around and see how large the crowd is. To do so is in some, not yet totally understood way, to experience resurrection as something happening now. And to do so is to gain strength for the journey ahead of us, as we remind a very secular world that we are now in the resurrection age; how treat we the least of those who stand among us is how we treat Christ’s own self. Amen.